The following is the full text of a statement made by the Leader of the Opposition in the Federal Parliament Hon. 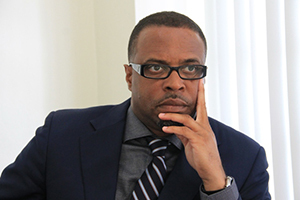 Mark Brantley on December 03, 2014, in response to a recent statement made by Federal Minister of Foreign Affairs Hon. Patrice Nisbett on the issue of E-Passport reissue. “This embarrassing retreat by the Minister of National Security is violently at odds with his assurances given to the Nation Parliament on November 26th, 2013 when, in the face of legitimate concerns expressed by the Canadian Government over the border scandal involving an Iranian holding a St. Kitts Nevis diplomatic passport entering Canada, the Minister of Foreign Affairs assured the Nation that the removal of the passport holder’s place of birth was entirely consistent with the provisions of the prevailing international law and custom. Put differently, just one year ago, the same Patrice Nisbett assured us all that there was absolutely nothing wrong with the removal of the place of birth from our passports. We now know that the Foreign Minister misled us all. This now 180 degree turn underscores the recklessness of this Labour/NRP Administration in dealing with serious matters of international relations. The statement by Minister Nisbett fails entirely to advise the Nation why the place of birth and previous names of the passport holder were removed from the St. Kitts Nevis passport in the first place. It fails to advise the people of St. Kitts and Nevis at whose behest and for whose benefit these radical departures from passport security norms regionally and internationally were made. The statement also fails demonstrably to set out the number of passports to be recalled and the cost to the taxpayer associated with the recall. The Nation has also not been told what happens if holders of the affected passports do not re-apply for a new passport within the time-frame set out by the Foreign Minister. Will economic citizens who presumably hold the vast majority of such passports, be stripped of their citizenship if they do not meet the deadline? The consequences here are far reaching. The Nation should be reminded that it is the taxpayers of the country who must now bear the burden of these colossal blunders. Not only must we pay the cost of this recall of passports but citizens affected must potentially bear the cost and expenses including stamps, passport photos, birth certificates and police records to re-apply for passports. We must also now obtain visas to travel to Canada, losing a privilege which we hitherto enjoyed. Most significantly, we must collectively suffer the embarrassment and humiliation to our national pride and dignity as Kittitians and Nevisians. Actions have consequences. Bad decisions by those in leadership positions impact not just the decision makers but every citizen of this young Nation. The Labour/NRP minority Government destroyed an efficient and effective passport system in St. Kitts and Nevis by introducing alien and reckless practices. They chose to ignore the warnings and expressed concerns of long-standing friendly Nations and allies of St. Kitts and Nevis. They did so not in the interests of the people of this country but in the interests of economic citizens from volatile regions throughout the world. Alas, you and I must now pay the price. Closing the barn door now that the horse has bolted will do little to persuade our international partners that they have a reliable and trustworthy ally in Basseterre. This purely reactive approach now that the damage is done can only serve to punctuate the point that foreign Governments cannot trust this Labour/NRP minority administration. Our Nation needs a fresh start with persons who have the necessary political capital and goodwill to rebuild trust and confidence with our allies around the world. Team Unity offers itself as that fresh start. Let us move beyond this dark period in our history with renewed hope and a clear vision for the future of our young Nation. Let us shed the baggage and permit our people once again to feel proud of this the land of their birth and their ancestry. The writing is on the wall. The evidence is clear. The time is now”.